Intermolecular forces (IMFs) are the forces that exist between molecules in a covalently bonded substance. These forces are what need to be broken apart in order for covalent substances to change phases. Note that when ionic substances change phase, bonds between the individual ions are actually broken. When covalent substances change phase, the bonds between the individual atoms remain in place, it is just the forces that hold the molecules to other molecules that break apart. 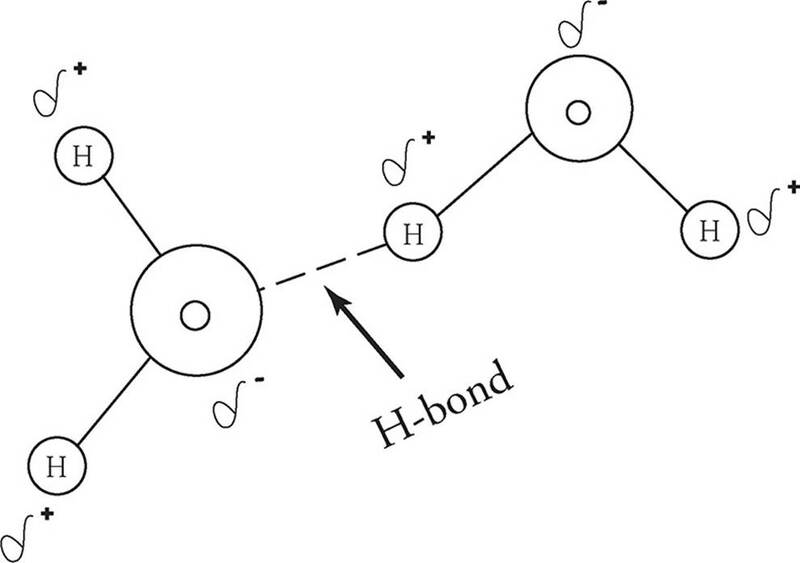 Hydrogen bonds are similar to dipole–dipole attractions. In a hydrogen bond, the positively charged hydrogen end of a molecule is attracted to the negatively charged end of another molecule containing an extremely electronegative element (fluorine, oxygen, or nitrogen—F, O, N). Hydrogen bonds are much stronger than normal dipole–dipole forces because when a hydrogen atom gives up its lone electron to a bond, its positively charged nucleus is left virtually unshielded. Substances that have hydrogen bonds, such as water and ammonia, have higher melting and boiling points than substances that are held together only by other types of intermolecular forces. Water is less dense as a solid than as a liquid because its hydrogen bonds force the molecules in ice to form a crystal structure, which keeps them farther apart than they are in the liquid form. Dipole–dipole forces occur between neutral, polar molecules: The positive end of one polar molecule is attracted to the negative end of another polar molecule. Molecules with greater polarity will have greater dipole–dipole attraction, so molecules with larger dipole moments tend to have higher melting and boiling points. Dipole–dipole attractions are relatively weak, however, and these substances melt and boil at very low temperatures. Most substances held together by dipole–dipole attraction are gases or liquids at room temperature. London dispersion forces occur between all molecules. These very weak attractions occur because of the random motions of electrons on atoms within molecules. At a given moment, a nonpolar molecule might have more electrons on one side than on the other, giving it an instantaneous polarity. For that fleeting instant, the molecule will act as a very weak dipole. Since London dispersion forces depend on the random motions of electrons, molecules with more electrons will experience greater London dispersion forces. So among substances that experience only London dispersion forces, the one with more electrons will generally have higher melting and boiling points. London dispersion forces are even weaker than dipole–dipole forces, so substances that experience only London dispersion forces melt and boil at extremely low temperatures and tend to be gases at room temperature. i. Large Molecules are more polarizable because they have more electrons. The phase of a substance is directly related to the strength of its intermolecular forces. Solids have highly ordered structures where the atoms are packed tightly together, while gases has atoms spread so far apart that most of the volume is free space. In other words, substances that exhibit weak intermolecular forces (such as London Dispersion forces) tend to be gases at room temperature. Nitrogen (N2) is an example of this. Substances that exhibit strong intermolecular forces (such as hydrogen bonds) tend to be liquids at room temperature. A good example is water. Ionic substances do not experience intermolecular forces. Instead, their phase is determined by the ionic bond holding the ions together in the lattice. Because ionic bonds are generally significantly stronger than intermolecular forces in covalent molecules, ionic substances are usually solid at room temperatures.